Because I wash so much, I’ve become quite aware of the amount of environmental damage because of the detergent we use as well as the amount of plastic bottles we throw away. 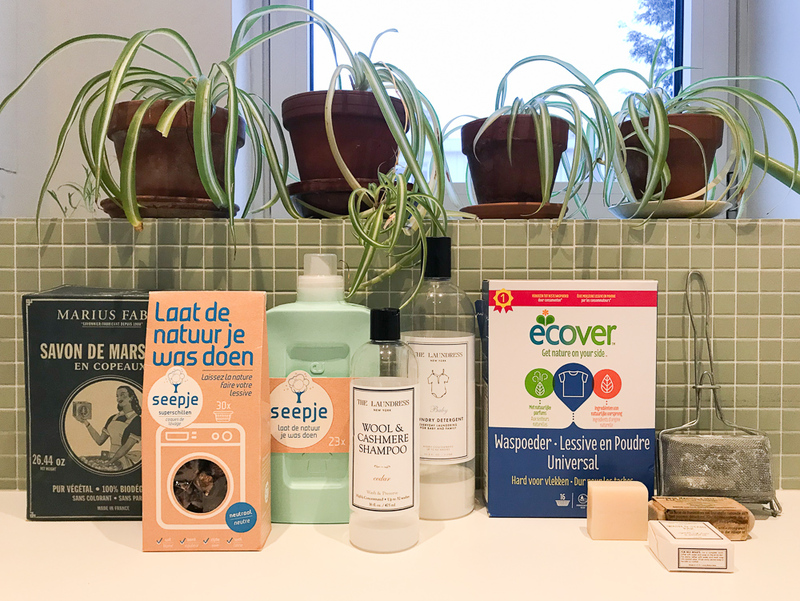 So over time, I have started to use ecological laundry detergents that I believe are less damaging for the environment (and at the same time, less damaging for our skin as well). First of all, I have started to use ecological laundry detergents of brands that claim they are polluting our planet less, using plant derived and bio-degradable ingredients. I like companies that are constantly working to make their products better, not just in terms of efficiency but also in terms of sustainability. Packaging is important too — avoiding (virgin) plastics wherever we can. Marseille soap: Marius Fabre offers a nice assortment of products for the laundry. I use the ‘Savon the Marseille’ flakes to soak especially dirty clothes (baby poo!) before I wash them in the machine. Marseille soap is 100% plant based and is entirely biodegradable. The flakes come in a cardboard box that can go in the recycling. Seepje also provides a liquid detergent that I like to use for delicate laundry that I wash on a lower temperature. This product comes in a plastic bottle, but it is made from (Dutch) recycled plastic and is fully recyclable. For all ‘normal’ laundry (towels, bedsheets, sportswear, jeans, etc) I use a powder detergent from an ecological brand (Ecover). It comes in a cardboard box, so it doesn’t create plastic waste. I like using a soap cubes to spot clean and to pre-treat stains or difficult areas (like collars, under-arm, bra straps etc). I also use them to hand wash. Above, you see my collection :). The big block is Marseille soap. Next to it, The Laundress lovely wash & stain bar (smells so great!). And that steel tool behind is a wire soap shaker! 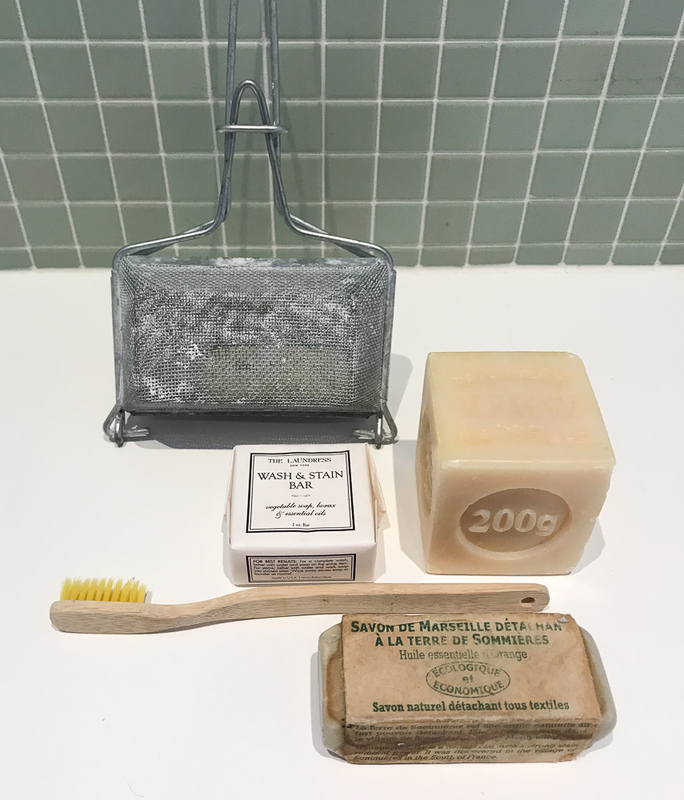 It fits the bar shaped Marseille soap in the front and I use it to create soapy water to hand wash. To treat stubborn stains, I sometimes use an old toothbrush. The above examples are all sold plastic free and are made from natural ingredients (vegetable oils). Cleaning rags, towels and bedsheets are the only items I wash on high temperatures. Even though I do use a dryer (it is unavoidable at the moment), I try to line dry as much as I can. I wash our own bedsheets weekly, but the children’s beds get changed just once every 2 weeks. Wintery woollens do not need a lot of washing as wool has self cleaning properties. Air drying is often sufficient. Do you have any thoughts about doing your laundry in a more environmental friendly way or do you have tips or great products to share? I would love to hear! What a great list! I also love castile soap (to help spot clean) and add either Borax or Baking Soda to my wash to help deodorize sweaty summer clothes and as a way to brighten colours and whites without using bleach products. Vinegar is another wonderful product, but it can wear away elastics and the rubber inside a washing machine over time (although I do sill use it occasionally on things like white towels, especially if I’m out of borax/baking soda). I read about Borax but it’s not so common here in the NLs. I’ll try to find it! How mush do you typically use? And on top of your regular (eco) detergent? What a great topic to put out there! I also use the wash nuts from Seepje for all my washing, including the delicates and wool, and I love the way they work and are environmental friendly as well. I always put essential oils in the fabric softener compartment so the laundry also smells nice (my favourites are rosemary and lavender) and it doesn’t stain or anything. I wish I could say that I wash the bedsheets only every 2 to 3 weeks for the environment, but I that would be lying, I am just a bit lazy in that department. Loved your other ideas too! Keep me posted about the laundry egg — it sounds intriguing! I wonder if it makes the laundry ‘fresh’ enough? Do let me know! I’m curious about how you’ve found the ecoegg with your washing? I read the link you gave and looks to goo to be true?! I currently use soap nuts but always open for new ideas. Hello Esther. Very interesting post. We live in Belgium, so I am familiar with the products are mentioning. I would like to know if the ‘Savon the Marseille’ flakes help to remove also other type of stains. With two small kids food, ink and grease stains pose the main challenge for our washing. Would you have any other tips how to get rid of them? If you live in Europe, seek out Hakawerk laundry and household products (German made). Both my mother-in-law and sister-in-law swear by them in France, and I am so sad that they do not export to the US. I haven’t seen those in The Netherlands yet! But I’ll look out for them. Organise your life with our newly designed weekly planner! Stuffel -- a clever storage solution for all those little Lego pieces.